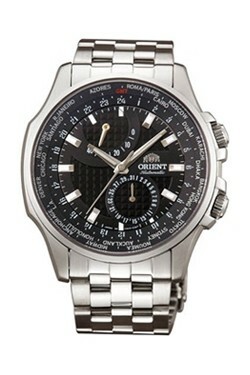 Orient Watch is a Japanese watch company which established in 1950, and has since became one of the largest mechanical watch production company in the world, which produces over 2 millions timepieces annually, offering a wide range of watch designs and styles, including mechanical, automatic, quartz, and light powered, at various pricing level. Thanks to the sponsorship of Orient, My Digital Life has a Orient Watch to giveaway to a lucky reader. The prize is a Orient Watch Journeyman model CFA05001B, worth $680.00. The Orient Automatic CFA05001B World Time executive watch is perfect for those on the run. Designed with travel in mind, this timepiece is an elegant way to stand out no matter where you are. Features of Orient Watch Journeyman include water resistant 100m, stainless steel case, screwed-down crown, skeleton caseback, 4-screw-fixed caseback, solid bracelet, 40 hours power reserve, sapphire crystal and etc. To get a chance to win the exclusive Orient Watch timepiece, what you need to do is simply post a reason of why you should be the one getting the watch or why you love the Orient Watch at the comment section. The entry can be of any length. The best entry will get the watch. In the case of multiple good entries have been submitted, a lucky draw will be conducted to select the prize winner among the qualified and selected entries. All entry must be posted together with a valid email address in the Email text box (no email address is required inside the writeup to avoid spam). Invalid email will automatically disqualify the entry. Email address will only be used to contact the winner. The contest is opened worldwide for everybody. Close Closed. Winner is Oliver. All entries (comments) must be posted before or on 23:59 PM December 21, 2011 according to time stamp that appears on the every comment posted. The timestamp is based on GMT + 8. My Digital Life reserves the rights to change the terms and conditions of the giveaway contest without prior notice, and all decisions is final.